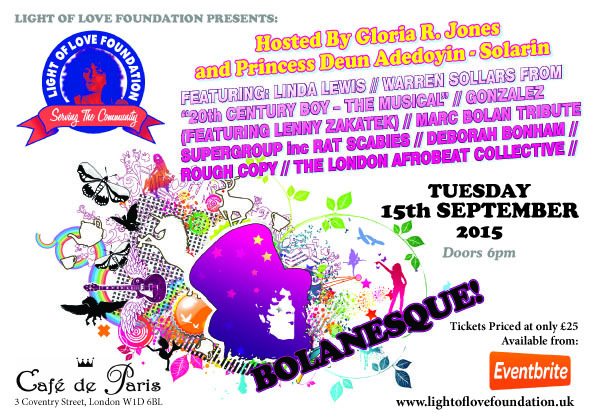 The Light of Love UK, the charity established to raise funds for the Marc Bolan School of Music, today announces Bolanesque 2015 – a musical event in London with a global impact. All money raised will go towards building the first Marc Bolan School of Music in Sierra Leone, West Africa. Inspired by the love of Marc Bolan and Motown legend Gloria Jones, this unique fundraising event brings together an outstanding line up of musicians and artists and will take its audience on an intriguing journey through the life of Marc Bolan & Gloria Jones – from Motown to glam rock, to a whole new generation of artists inspired by Marc Bolan’s legacy across the globe. Hosted by Gloria Jones and African TV personality and talk show host, Princess Deun Adedoyin-Solarin, acts such as Tyrannosaurus Jed and Paul Rowan (Marc Bolan tribute artists), Gonzalez (featuring Lenny Zakatek), Linda Lewis, Rough Copy, will all perform on the night alongside northern soul artist Nya King, as well as other popular African artists to be confirmed. Bolanesque 2015 features a selection of Marc Bolan and Gloria Jones hugely memorable hits including “Get it On”, “I Love to Boogie”, “20th Century Boy”, “Children of the Revolution”, and “I haven’t Stopped Dancing Yet” performed by Marc Bolan tribute acts and Warren Sollars from 20th Century Boy – the Musical. 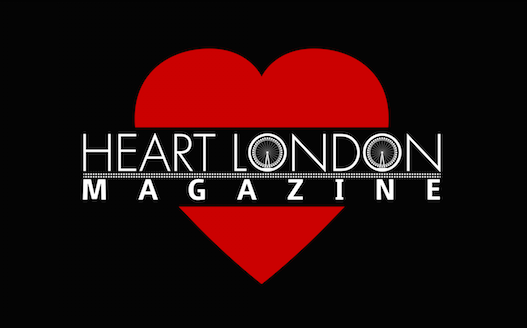 The line up of entertainment also includes a homage to Marc Bolan’s obsession to create ‘Music with a Fashion twist’ with a fashion show featuring the Gloria Jones Northern Soul clothing line, designed by top London fashion designers Taetum Jones. Tickets are on sale today exclusively from http://bolanesque2015-light-of-love-live-show.eventbrite.co.uk and cost £25.00. All proceeds will go towards building the first Marc Bolan School of Music in West Africa. The charity aims to raise upwards of £40,000 in funds so that the Marc Bolan legacy can live on in a country where children are orphaned, underprivileged, vulnerable and disadvantaged. The first Marc Bolan School of Music is due to open in 2016 in Sierra Leone, West Africa to offer the opportunity for young people to come together to develop their skills and talents in the heart of their community. Taking inspiration from Marc Bolan’s own incredible level of creativity, the school will include an outdoor film school, music rooms, musical instruments, classrooms, a community cinema, a library and an open-air amphitheatre. For more information about the school, or to make a donation please visit www.marcbolanschool.com.